Which craftsmen and designers you go to if you need a stylish, functional and top class leather business bag? Right. Italians. There is no other nation in the world that would have so many brands specializing in leather accessories. And this brand is no exception to that. Clean lines, amazing classic and trendy designs in combination with a good price, make them a sure choice when it comes to selecting a business briefcase, laptop bag or a handbag for business. As the name suggests this leather accessories company was established in 1919 in Vallesella in Cadore region of Italy. The company's first business was the leather eyewear cases. The brand under its current name was established in 2000 and it continues the legendary Italian craftsmanship and manufactures leather products, such as briefcases, bags, backpacks, small cases, as well as top quality executive stationery. They are considered high end accessories, but the price range is rather inexpensive for this quality handbags. For example, some of their quality leather briefcases cost starting from 250 EUR, which is about $330. There are several collections today, offering very laconic shaped and beautiful men's handbags - Classical, Spiga, Vendange, City, Exe, Wall Street and other. This company has its stores around the world, in New York, Hong Kong and Italy, of course. If you want to buy online then Yoox and Forzieri offers some of the accessories. 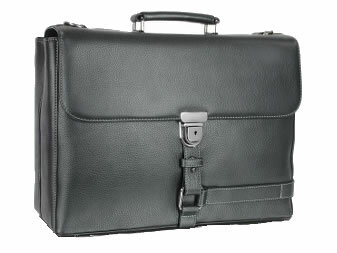 For 473 EUR (USD 627) you can buy this top class executive two compartment briefcase made in grained leather. It features zipped pocket, a special padded pocket for your laptop (size is up to 15" screen) and external leather straps for a newspaper. There are also other extra pockets for organization, pen holders and card holders. The shoulder strap is removable and the size of this bag is 15.7" x 11.8" x 4.7". This handbag is made in best Italian artisanship traditions and is sold under the Wall Street collection. You can also buy it online.